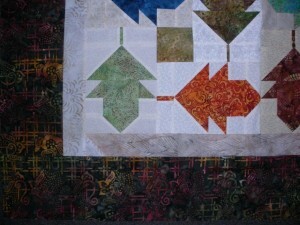 With chevrons coming in, I thought I’d better get this going. I have to get some muslin for a back. I wanted a very random look. 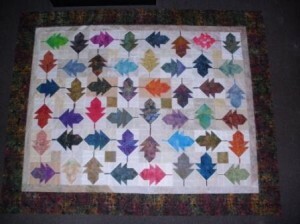 I’ll free motion quilt with acorns in the small squares and make myself do an all over pattern. I had a multi-colored batik fabric in dark autumnal colors that works well. It looks great! I love the idea of adding acorns in the quilting design. The randomness does make it look like they just fell from the tree. Very nice. Looks awesome, Jude! I think your layout is perfect, too.